During my last semester as an undergraduate I rented a big room in an old farmhouse for – brace yourselves, young readers -- $45 per month. Or was it $54 per month? We’re talking 40 years ago, which explains why I can’t remember exactly what I paid and also why I paid so little. The other possible reason why the rent was so low: My room had no heat. On winter nights I would select the clothes I wanted to wear the next day, stuff them into my sleeping bag and wriggle into them in the morning while still in my warm bed. When I got up I could see my breath and, if I were so inclined, write my name in the frost on the inside of the windows. That experience may account for my skepticism about the “genuine need for new, high-quality housing options for State College students” that Toll Brothers hopes to meet by erecting 141 “cottage-style buildings” on 40 acres of ag land between Whitehall Road and Shingletown Road. The other amenity Toll Brothers is dangling under the noses of the 1,000-plus prospective tenants of “The Cottages at State College” is a free CATA pass, which is supposed to allay concerns about the project’s impact on traffic between cottages and campus. But I have a feeling that students whose parents can afford to install them in a development with “resort-style amenities” would rather show off their similarly “high-quality” cars than ride the bus. Brace yourselves, Blue Course Drive users. In any event, the spiffiness of The Cottages isn’t the issue for the Nittany Valley Water Coalition. As the group’s name suggests, it’s the development’s impact on area water quality that they’re most worried about. Toll Brothers says it has bent over backwards to make sure no fouling of the water supply will occur. NVWC is deeply skeptical. The university bought the land from a bank for just under $100,000 in 1999. At the time, the parcel lay outside the Regional Growth Boundary, meaning local officials had agreed that it was a good idea to keep the region from sprawling endlessly out to the ridges while protecting scenic values and water quality. 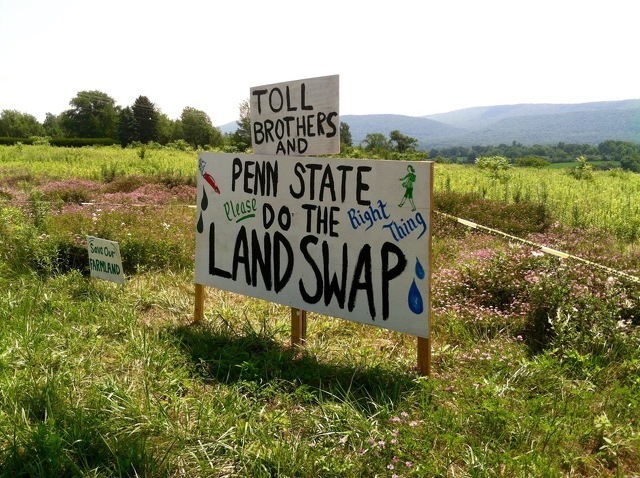 Four years later, Penn State got Ferguson Township to rezone the land from low-density rural agricultural to high-density multifamily residential. Then, in 2012, it flipped some of the acreage for $13.5 million to Toll Brothers, which set to work on plans for The Cottages. A lower court ruled against those plans, a higher court ruled in favor, and now we’re waiting to see if the Pennsylvania Supreme Court will hear the case. In the meantime, NVWC members are camping on the property, trying to shame the university into backing out of the sale by offering Toll Brothers a lower-impact site closer to town. 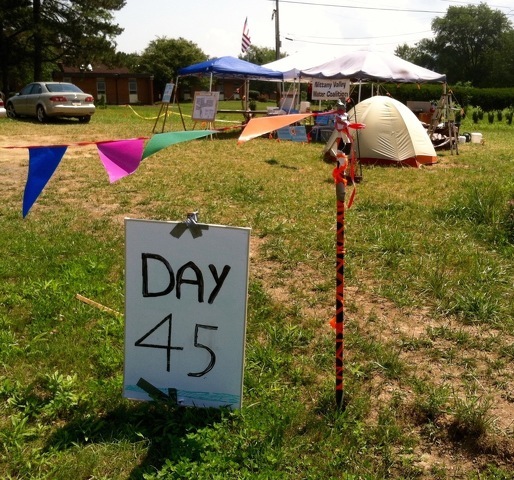 As of mid-July NVWC members had been camping at the site of the proposed development in Ferguson Township for more than six weeks. Photo by Russell Frank. 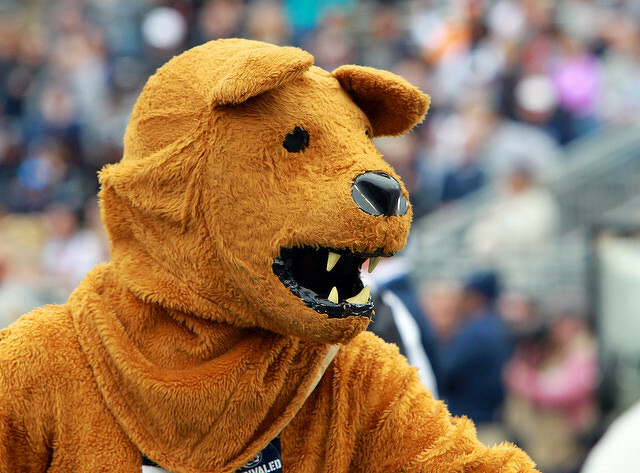 Penn State hasn’t ruled out a swap, according to Charima Young, the university’s director of local government and community relations. But finding an alternative site won’t be easy, she told me in an email. The good news is the sides are talking. Meetings between the coalition and the university are supposed to happen in the next week, and between NVWC and Toll Brothers in early August. While I was visiting what NVWC members jokingly refer to as their “luxury encampment,” a few passing motorists shouted “Get a job!” -- assuming, incorrectly, that the protesters must be old hippies who have nothing better to do than stir up trouble. 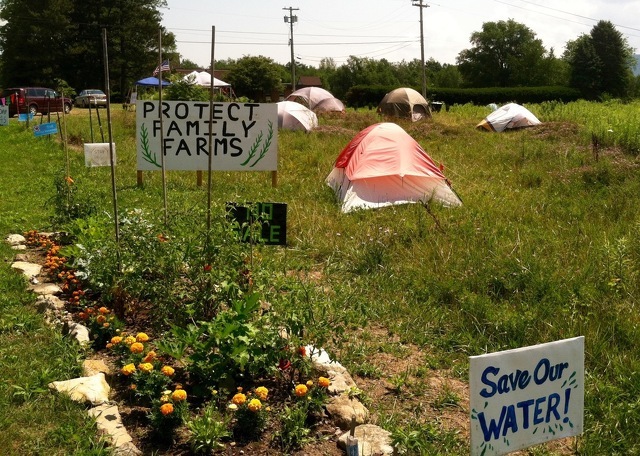 In fact, the site occupiers and the folks who stopped by to pick up yard signs looked like a pretty good cross-section of academics, site neighbors and community members. One visitor wore a visor with “America 1976” emblazoned on it. If there’s one thing folks across the political spectrum can agree on it’s the need for clean water. Walk the site if you haven’t already (there’s a parking area on Shingletown Road). Roughly midway between Shingletown and Whitehall, a bit of a rise offers a lovely panoramic view of ridges and farmland. It would be a shame to lose that view, not to mention potable water, all for the sake of student housing that offers “resort-style amenities.” Let those well-heeled students satisfy that “need” after college. They’ll appreciate the finer things in life all the more if they’ve roughed it a bit as undergraduates. Putting it another way, they’re better off hiking that land than living on it. Penn State's chapter of Uplifting Athletes continued to make a difference in a big way this past weekend as the 15th annual "Lift for Life" raising over $95,000 to benefit Uplifting Athletes and its commitment to rare disease research.